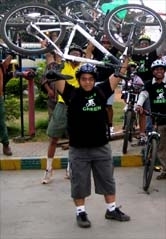 Go Green Campaign Ride supporting Vinuju of IYCN's Green Ride 08 Nov 2009 - GGI-Group size: 4000+ Professionals, Increasing on day to day basis, Come & join us 2 serve Mother Nature. show solidarity to the cause of climate change and 350. Started from Kerala on Oct 24th by 10 students and all the 9 got exhausted except Vinuju. 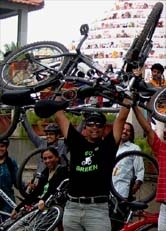 We as a true GGI's decided to support the ride and welcomed him to be part of our Go Green campaign ride. The day started off by showers and made the ride even more challenging to start however 40% of the confirmed participants dropped out. After giving interview to TV 9 we started of by 6:30am. RIS Junction jaynagar 5th Blk- Jaynagar 4th Block - Jnagar 3rd block - Ashoka Pillar - Lalbagh West gate - Minerva Circle - Town Hall Hudson Circle - Cubbon Park - City Library - Malya Hospital, hotel Ramanashree - Residencey Rd flyover - doubel road -Lalbagh Main gate - Lalbagh rear Gate - Ashoka Pillar - Swiming Pool road - Jaynagar 4th block - KFC - Jaynagar 5th Blk Cofee day/ Apple Mac show room. 2) Decathlon make Multi took kit set. 3) Decathlon make Sleek hand pump. 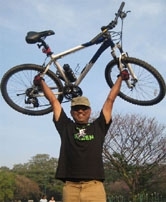 all in all, it was a memorable ride that we had along with Vinuju. Hope every one of them enjoyed..